Dog Health, What Human Foods Can Dogs Eat? 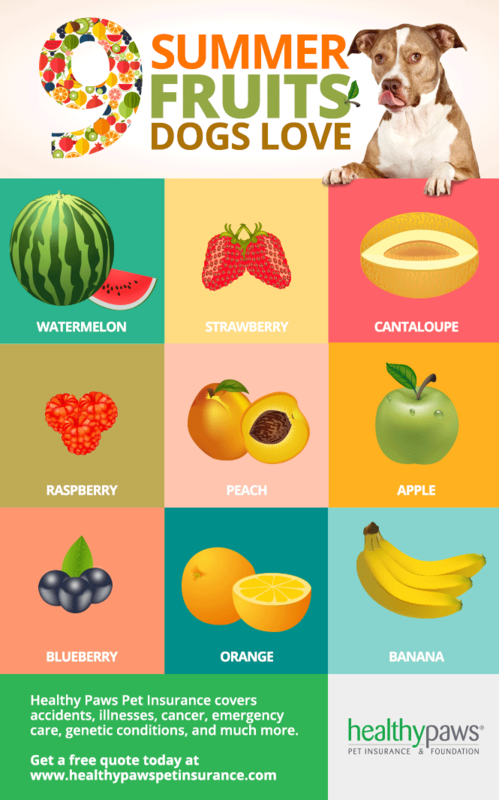 Summer’s delicious fruits are packed with healthful antioxidants and nutrients that also can be tasty to pups trying to beat the heat. Plus, most fruits are 70 to 90 percent water, perfect for keeping pups hydrated in hot weather. Check out these nine summer fruits dogs love, complete with DIY dog treat recipes. Yes, dogs can eat watermelon! Be sure to remove the majority of seeds, which can cause intestinal discomfort or even blockage if too many are ingested. Since watermelon is made of 92 percent – you guessed it – water, the sweet fruit is great for keeping pets hydrated and preventing heat stroke. It’s also chock-full of vitamins A, B6 and C, which can make your dog’s coat shinier and keep teeth in good shape. Freeze cubed watermelon for a quick, frosty summer treat, or blend watermelon with honey and Greek yogurt for homemade pupsicles. Use a popsicle mold with a rawhide “stick,” or pour the slushy mixture into paw- or bone-shaped molds. Another fruit dogs can safely have, strawberries are perfect bite-sized treats for pups with a sweet-tooth. Removing the leaves and stem is optional – dogs do eat grass, after all – and even wild strawberries are okay, too. Limit Fido’s strawberry intake to a handful; like with any food, too much of a good thing can cause gastrointestinal upset and diarrhea. Obviously, keep the chocolate-covered strawberries out of paws’ reach – they can be deadly to dogs. To cool down hot dogs on a summer day, make an ice lick! Spray a bowl or tupperware container with non-stick spray, then fill with water; add your choice of berries or chopped fruit, then freeze. Place the dog ice lick in a shady spot outside for your pet to enjoy. Loaded with vitamin A, cantaloupe is a great fruit for dogs. The melon gets its orange color from beta carotene, which is known for improving eyesight. Senior dogs or those with glaucoma or cataracts can benefit from consuming cantaloupe, and it’s great for preventing eye conditions. Remove the rind and lay off the salt, which can cause excessive thirst and urination, dehydrating your dog. Use a melon baller to scoop out bite-size bits, or chop into chunks – just make sure they’re small enough and not a choking hazard. Or, like with any fruit for dogs, blend with your pup’s favorite fruits, yogurt, and freeze for pupsicles. Another berry dogs can eat, raspberries can be a little tart for some pets. This fruit is low in sugar – which is a plus, considering most pet parents don’t brush their dog’s teeth regularly – and provides pups with a little fiber. Raspberries also have anti-inflammatory properties, perfect for dogs with arthritis or bowel disease. However, limit your pet’s portion to a cup or less, as raspberries naturally contain xylitol, which is dangerous for dogs in large doses. Blend raspberries with a dog-safe sweeter like Greek or plain yogurt and honey, then freeze in popsicles or ice cube molds. For the all the canine cooks out there, try Doggy Dessert Chef’s raspberry chicken dog treat recipe. Before we get into the fun side of this fruit, it’s very important to note that you should never ever give your dog a peach pit. (this goes for other stone fruits too, like plums, pears and apricots!) In addition to possibly creating an intestinal obstruction, peach pits contain low levels of cyanide. If your dog consumes a single peach pit, the odds of cyanide poisoning are low, but keep a lookout for symptoms like dilated pupils, dizziness and excessive salivation. However, don’t give your pet canned peaches either – while they not have a pit, the sugary, preservative-heavy syrup can create intestinal discomfort and has no nutritional value. Leave the skin on peaches for added fiber; toss them in a blender for picky pups or freeze slices for a sweeter ice cube-like treat. These “Peachy Keen Chewy Oatmeal Dog Cookies” from Dog Treat Kitchen have tons of fiber and are human-friendly, too! High in fiber and naturally sweet, apples are a staple of most homemade dog treat recipes. Core the apple and remove all seeds before feeding to your dog, as they contain low amounts of cyanide. Apples slices and peanut butter, a popular human snack, is a great natural teeth-cleaner for dogs – they also freshen bad breath! For dogs on a bland food diet, unsweetened or homemade applesauce is the perfect healthy dessert. Slice apples into french fry-like pieces, then place in an ice cube tray with water to freeze! There are tons and tons of apple recipes for dogs, so check out this convenient list by Irresistible Pets. Often called a “superfood,” blueberries are just as good for dogs as they are for humans. Their bright color indicates high antioxidant levels, which keeps pets’ immune systems in tip-top shape. With 3.6 grams of fiber per serving, blueberries are perfect for senior pets; their relatively low sugar content makes them a healthful snack. Blueberries also contain potassium, a type of electrolyte that keeps pets healthy and hydrated. Dogs with low blood potassium, or hypokalemia, can suffer from weight loss and even death, so it’s important to maintain a balanced diet. Mix a handful of frozen blueberries into your dog’s dry food for a sweet crunch. Add them to your DIY dog ice lick, blend them in pupsicles, or make these drool-worthy peanut butter blueberry dog treats from Cookie Monster’s Kitchen. Feed this fruit to your pet in moderation, as the citric acid can cause gastrointestinal upset, just like in humans. Don’t go overboard the first time you give your dog oranges – they can cause diarrhea in some pets. Oranges, tangerines and clementines are all high in sugar, so make citrus fruits an occasional treat or use sparingly in frozen treats to prevent obesity and dental issues. Remove the peel before feeding orange slices to your dog, as it’s difficult to digest (and not very tasty). Oranges add a pop of flavor to any frozen dog treat, like a pupsicle or smoothie pop. To freshen bad breath in dogs, try this orange mint dog treat recipe from The Black Pug; mint also soothes stomachs and reduces gas. Another fruit that goes perfectly with peanut butter, dogs will gobble down a frozen banana faster than you can say “lickety banana split.” Don’t overdo it though – an inch-long section of banana is the perfect portion. 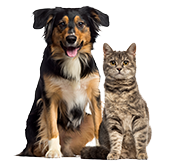 Too much of a good thing can cause elevated potassium, putting pets at risk of developing constipation or hyperkalemia. Whip up a batch of “pupcakes” for your dog’s birthday or a play date! Try the above banana pupcakes recipe from Peace and Woof, or serve some dog-friendly banana pancakes for breakfast – hold the syrup. Curious about what is okay (and not so okay) for your dog to munch on? Check out our other articles on what human foods are safe for dogs.